The FEED NOVA SCOTIA website tells us that 21,760 Nova Scotians were assisted by food banks during March 2013. Meal programs and soup kitchens collectively served 154,330 meals and 18,724 snacks during the same month. During the month of February 2014, you can combine a visit to the library with a good deed for the less fortunate who use food banks in your area. The Annapolis Valley Regional Library is once again offering a Food for Fines initiative from February 1-28. Just give us a non-perishable item for the local food bank and we’ll forgive up to $3.00 in fines. And the really good news is that there is no limit on the number of fines which can be forgiven! Do you owe $8.50? Three food items will take care of that. 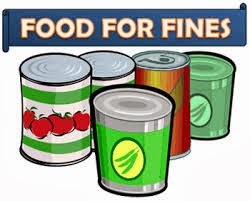 Please note that Food For Fines applies to fines only, not other fees like lost books or printing costs. Every Day is Family Literacy Day at the Library! awareness initiative created by ABC Life Literacy Canada in 1999 and held annually on January 27 to raise awareness of the importance of reading and engaging in other literacy-related activities as a family. For many years, here at AVRL we planned Family Literacy Day celebrations, and many were very successful (who remembers our Sleepovers at the Wolfville Library?). After all, we do love literacy here at the library. But never a year went by that we did not have to cancel some of our programs due to weather. In fact, we started calling January 27 Snow Day. While we do have a few events planned, we would like to invite you to plan on celebrating Family Literacy in your own home. After all, that’s where Family Literacy really happens! 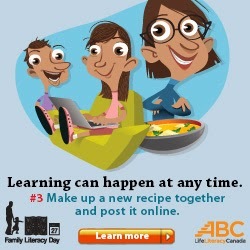 ABC Life Literacy Canada has some great tips, such as these 15 Minutes of Fun tips. They have lots of other activities that you can do from home here . We encourage you to check out some books and share them as a family. We’ve got lots of booklists to help you choose the right book for your family, such as these audiobooks . Or maybe you are looking for a new story to incorporate into your bedtime routine? And look for the new 50 Best Books for Babies poster that was created by Read to Me. Not only will we have the posters around to entice you to read to your baby, we also have the books for you to check out! Adults, don’t feel left out! Modeling is a great way to share literacy in your family. Turn off the TV and the laptops and the iPads, and set aside a family reading time. Encourage everyone to grab a good book and read. Imagine how cozy to have everyone snuggled under a blanket, each reading their own book! Parents, we’ve got great book choices for you in our Staff Picks. So, plan your own Family Literacy Day on January 27, because if or predictions are correct, it will probably snow that day. However, several of our branches do have events planned, so you can trek over to Windsor on Sunday, January 26 for games, treats, reading, and prizes or to Berwick on Monday, January 27 for a special Bark George story & craft. At a recent Library Board meeting a question arose about a $300 charge from Access Copyright. 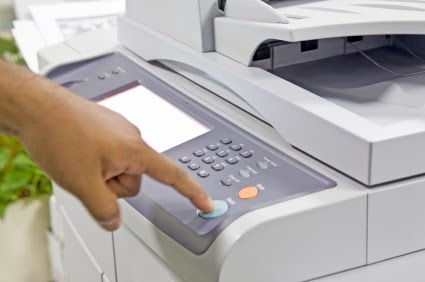 I explained that libraries providing photocopier access to the public must pay the Canadian Copyright Licensing Agency an annual fee to ensure that when our patrons photocopy something that is copyright protected it is legal to do so. Huh? This has nothing to do with photocopier leases or paper and ink costs; it is Canadian law that we must pay an annual fee for patrons to photocopy pages from our books. The $300 is just for four photocopiers and is based on population. More people and photocopiers mean higher fees to pay. The fees ostensibly go back to the creators and publishers. But that’s just the tip of the iceberg. Libraries have to pay for public performance rights to show movies even if they own the movie. We are also supposed to pay SOCAN (Society of Composers, Authors and Music Publishers of Canada) fees to play music. I had quite a lively conversation with a SOCAN rep on the phone one day when he tried to tell me that singing songs in preschool storytime could violate SOCAN laws if the songs were copyright protected and I didn’t pay for a license for each branch library. I ended the conversation with the challenge for him to tell me who owns the copyright to the Hokey Pokey. I agree that artists, whether they are writers, musicians, filmmakers, etc., need to be protected by copyright and should be fairly compensated for their work, but the reality is the money we spend on these licensing fees depletes our ability to pay for books and other library materials. Speaking of licenses, think about all the software licenses we have to pay for each computer. The Annapolis Valley Regional Library has 67 computers for the public to use as well as our own staff computers. A simple upgrade to a new version of Windows is a costly endeavour even with special education discount rates. There are many hidden costs to running a public library, but the dollars invested in library service pay back the community ten-fold. We are now in the depths of cold and flu season. We may be able to control our appliances from work via our smart phone but there is no cure for the common cold. We use many things to try and prevent it: garlic, flu shots, echinacea, or vitamin C. If we do come down with it the local drugstore has shelves full of options for relief. Some of us will get sick some of us won't. The reasons will probably not be apparent but might be due to one simple act - washing your hands. This is one thing that we all can do. Just lots of soap and water, a simple yet effective way to combat the transfer of germs. Not only will it help in terms of cold germs but other viruses as well. From shopping carts to door handles we encounter hundreds of surfaces a day that can harbour germs. We don't have to invest in antibacterial soaps; studies have shown that any soap will do as good a job or better. Frequent hand washing will go a long way in keeping you healthy this winter. So lather up and have a Happy and Healthy New Year.